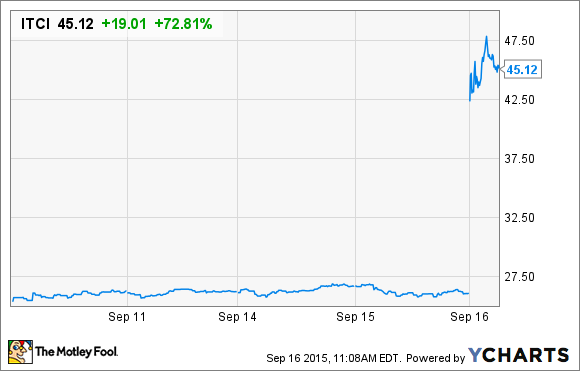 A positive late-stage data readout sent Intra-Cellular Therapies' stock soaring today. This rocket-like rise in share price was brought about by a positive data readout for the company's late-stage experimental drug, ITI-007, indicated for the treatment of schizophrenia. According to the press release, patients in the intent-to-treat study population showed a statistically significant improvement on their Positive and Negative Syndrome Scale total score (PANSS) compared to those receiving placebo. Put simply, patients on the drug exhibited fewer overall symptoms associated with schizophrenia, relative to those taking a placebo. Another key issue is that the drug didn't result in any meaningful changes across a diversity of potential side effects common to medicines used to treat schizophrenia, according to the company. So what: Schizophrenia is a serious mental illness with inadequate therapeutic options at present. The currently available medicines only treat a handful of the disorder's symptoms, and also come with a host of problematic side effects. Intra-Cellular Therapies is thus hoping that ITI-007 can meed this unmet medical need. Now what: This study is the first of two planned late-stage studies to assess ITI-007 in schizophrenia. While the details on the second study are sparse at the moment, the market is obviously encouraged by the fact that the drug's late-stage results are broadly similar to those from its prior mid-stage trial. In other words, the market appears to think that ITI-007 is largely "de-risked" as a schizophrenia treatment following these impressive results. Given the strong likelihood that a capital raise is going to be coming down the pike soon, though, investors that missed this massive run-up may not want to chase this stock today.